Hynes, H. Patricia (1989). The Recurring Silent Spring. Athene series. New York: Pergamon Press. ISBN 0-08-037117-5. Lear, Linda (1997). Rachel Carson: Witness for Nature. New York: Henry Holt. ISBN 0-8050-3428-5. Lytle, Mark Hamilton (2007). The Gentle Subversive: Rachel Carson, Silent Spring, and the Rise of the Environmental Movement. New York: Oxford University Press. ISBN 0-19-517246-9. Murphy, Priscilla Coit (2005). What a Book Can Do: The Publication and Reception of Silent Spring. Amherst: University of Massachusetts Press. ISBN 978-1-55849-582-1. Kline, B. First Along the River. Maryland. Rowma & Littlefield. Lutts, R (1985). 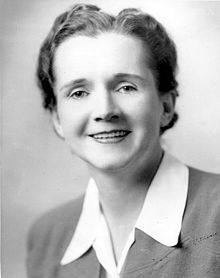 Chemical fallout: Rachel Carson's Silent Spring, Radioactive Fallout, and the Environmental Movement. Environmental Review. gottlieb, R. Forging the Spring. Washington D.C.: Island Press. Brooks, Paul (1972). The House of Life: Rachel Carson at Work. Houghton Mifflin. ISBN 0-395-13517-6. This book is a personal memoir by Carson's Houghton Mifflin editor and close friend Paul Brooks. Jezer, Marty (1988). Rachel Carson: Biologist and Author. American women of achievement. Chelsea House Publications. ISBN 1-55546-646-X. Matthiessen, Peter, ed. (2007). Courage for the Earth: Writers, Scientists, and Activists Celebrate the Life and Writing of Rachel Carson. Mariner Books. ISBN 0-618-87276-0. Moore, Kathleen Dean; Sideris, Lisa H. (2008). Rachel Carson: Legacy and Challenge. Albany, New York: SUNY Press. ISBN 0-7914-7471-2. Quaratiello, Arlene (2010). Rachel Carson: A Biography. Amherst, New York: Prometheus. ISBN 978-1-61614-187-5. หน้านี้แก้ไขล่าสุดเมื่อวันที่ 17 กรกฎาคม 2561 เวลา 13:19 น.